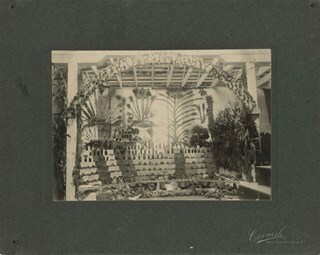 Photograph of a vegetable exhibit and the interior of Central Park Agricultural Hall. A card accompanying the display reads in part, "Not for Competition / Burnaby [Production?] by Wm. Coulter [?]." Another sign reads, "Grown from Rennie's Seeds." 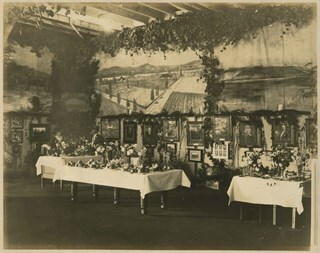 Photograph of an exhibit of produce from Oakalla Prison Farm and the interior of Central Park Agricultural Hall. A sign above the display reads, "Produce from the Oakalla Prison Farm," and a sign to the left reads, "Not for competition." 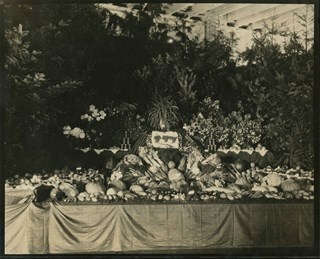 Photograph of a vegetable display at the 14th Annual Exhibition of the Central Park Agricultural Association and Farmers' Institute that took place from the 17th to 19th of September, 1914. The display "Surprise Poultry Yards Collection of Vegetables" features the First Prize card on its display. Photograph of a vegetable display with a sign that reads, "GROWN FROM/ RENNIE'S/ SEEDS" and another sign indicating that the display is "Not for Competition/ Burnaby Production/ by/ Wm. Baily [illegible]". This is most likely at the 14th Annual Exhibition of the Central Park Agricultural Association and Farmers' Institute that took place from 17th to 19th of September 1914. An earlier catalogue record from 1988 notes that the agricultural fair was held between 1902 to 1921 in the Central Park Agricultural Hall built in 1902 in Central Park on Kingsway and the B.C.E.R. tracks. Photograph of a threshing machine working in a field. 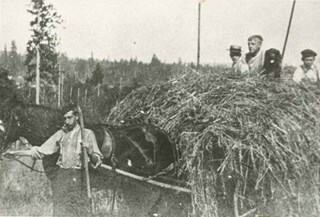 An unidentified man can be seen sitting on top of a pile of hay on a wagon. Written under the photograph is: "Threshing at Frost's Sept. '23." The picture was taken in the Tynehead area of Surrey. Photograph of the Burnaby Exhibit at the Dominion Exhibition held in New Westminster. Fruits, vegetables, grains, and preserves are displayed inside a building. "Burnaby" is spelled out on an arch above the display. 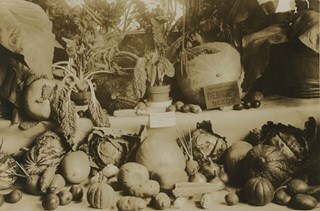 Photograph of William Whiting's agricultural display at New Westminster. Vegetables, fruit, grains and preserves are displayed inside a building. 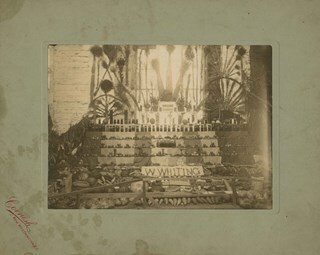 "W. Whiting" is spelled out at the base of the display. A sign reads "Third Prize." 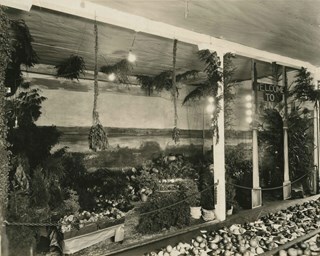 Annotation on back of photograph reads, "This exhibit was grown w. my garden at Burnaby Lake"
Photograph of Burnaby's Agricultural Exhibit at New Westminster. Vegetables, fruit, plants, flowers, and trees are on display inside a building. There is electric lighting. A sign on the right is shaped like an arch and reads, "Welcome to Burnaby." A mural showing Burnaby Lake is behind the display. 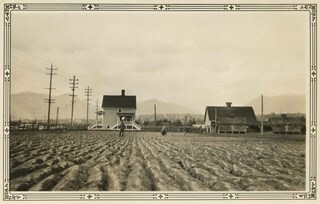 Photograph of Burnaby's Agricultural Exhibit at New Westminster. Vegetables, fruit, preserves, flowers, and plants are on display inside a building. There is electric lighting. A sign above the display reads, "Burnaby." A sign above a container on the lower left reads, "Ginseng / Grown in Lozells District by Mr. Romer." 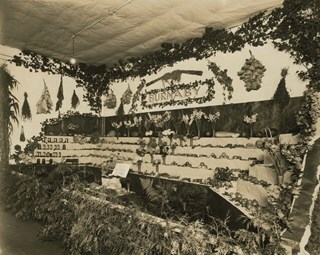 Photograph of Burnaby's Agricultural Exhibit at New Westminster showing a display of vegetables, fruit, flowers, plants, and trees inside of a building. Photograph looking over a field towards a house and barn in the background. The farm has been identified as that belonging to E.W. Nicholson of the Broadview district. 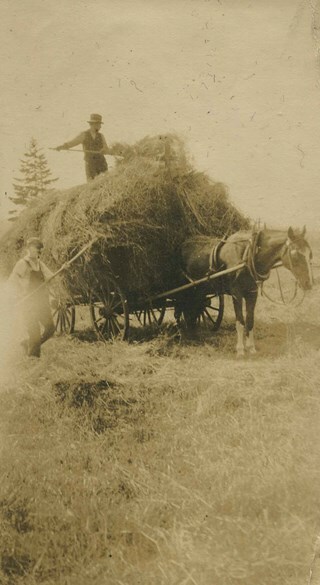 A note on the back of the photograph reads: "Haying time on farm of E.W. Nicholson." 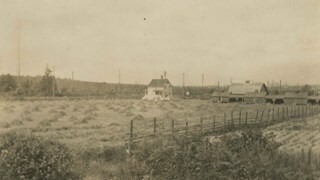 Photograph looking over a field toward a house and barn identified as E.W. Nicholson's Broadway Jersey Ranch. A note on the back of the photograph reads: "Our farm home - Broadway Jersey Ranch 1993. 3704 Boundary Road at G.N.Ry Crossing Burnaby BC. Property occupied and owned by E.W. Nicholson from May 23, 1900 to Sept. 29, 1951. Property sold to Link-Belt Co. in 1951." 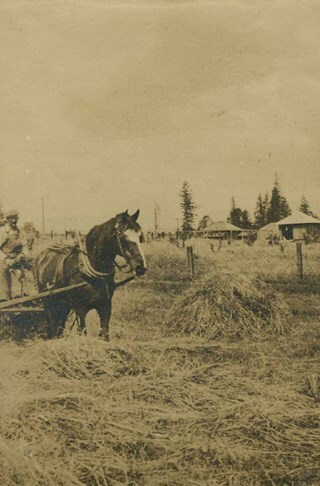 Photograph of a man (probably Claude Hill) with a horse and hay rake, tending to a field of hay. Kitty Hill is in the foreground holding some loose hay. This photograph was likely taken on the Hill farm, known as Brookfield. 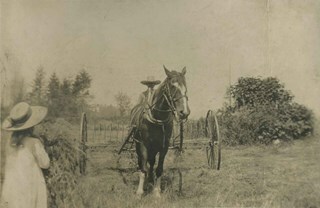 Photograph of horse, "Tom," pulling a hay rake through a field. The photograph appears to have been taken at the home of Claude Hill in the Burnaby Lake area. 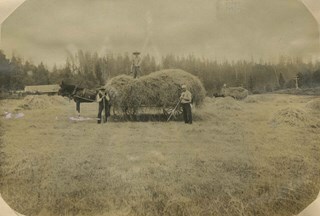 Photograph of Claude Hill on a hay rake being pulled by the workhorse, "Tom." His daughter, Kitty, wrote the caption "Dad at Deer Lake" next to this photograph. 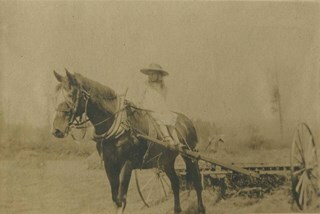 Photograph of Kitty Hill riding on her horse Tom, who is pulling a hay rake. The photograph was taken at the Hill family farm on Deer Lake Avenue, known as Brookfield. This is the current site of the Burnaby Village Museum. 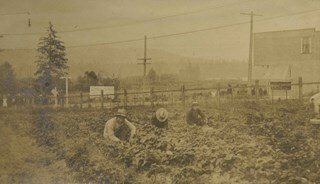 Photograph of Burnaby's Agricultural Exhibit at New Westminster. Tables with fruit, vegetables and flowers are displayed. Greenery and photographs (mainly of people) are on the walls, including a portrait of former Reeve Nicolai C. Schou (second portrait from right). A sign in the corner reads, "Burnaby's Exhibit," and a mural hangs on the walls above the exhibit. A woman and man are standing behind a table at the back left. 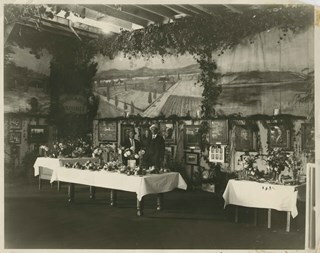 Photograph of Burnaby's Agricultural Exhibit at New Westminster. Fruits, vegetables and flowers are displayed on tables. Greenery and photographs (mainly of people) are on the walls, including a portrait of former Reeve Nicolai C. Schou (second portrait from right). A sign in the corner reads, "Burnaby's Exhibit," and a mural hangs on the walls above the exhibit. Two men are standing behind a table in the centre. 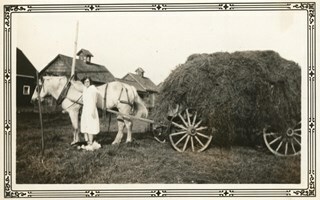 Photograph of Elsie Nicholson standing next to the horse named "Holly" at the Nicholson farm in the area of Boundary Road and the C.N.R. rail line. The barns and farm outbuildings can be seen in the background. 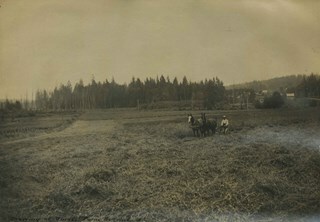 Photograph of workers in the field picking crops on the farm belonging to F.J. Hart. The property was on the corner of Douglas Road (later Canada Way) and Sperling Avenue although the Hart House was located at 6664 Deer Lake Avenue. 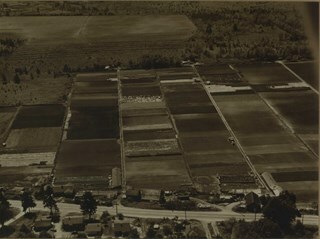 Photograph of cultivated farmlands and rows of different kinds of crops. In the centre are low lying plants, possibly strawberries, and to the left, there are tall deciduous trees. To the right are waist high shrub-like trees. There are workers harvesting from this crop, that could possibly be rasberries. The property could belong to Bernard Hill, who owned 24 acres of farmland, mostly of strawberries. 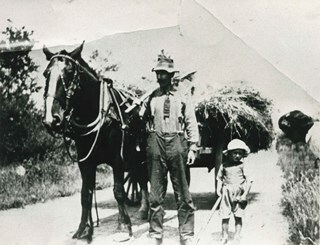 Photograph of a farm with men, a horse and wagon, and children in a field. An annotation on the back of one of the photos reads, "The foreground farm property stood at the corner of Sperling Avenue (formerly known as the Pole Line Road) and Buckingham. The white house in the left centre was the residence of Miss Woodward, her mother and sister. It was the first post office at 'Burnaby Lake' and the site of the kindergarten school of Miss Harriet Woodward. It later became the United Church. / The open field in the distance above the horse's head and people in the field is the field in front of the 'Manor House' which was built by Mr. Bateman in the 1920's. To the right of and beyond the white house partly hidden by the trees can be seen some of the buildings associated with the Hill farm on Deer Lake Ave. which by the date (1909) of this photo had been sold. The distant tall trees (center) stand on the site of the Municipal Buildings (DesBirsays Woods)." An annotation on the back of the other photograph reads, "Formerly belonging to Malcom Nicolson / App. 1908." 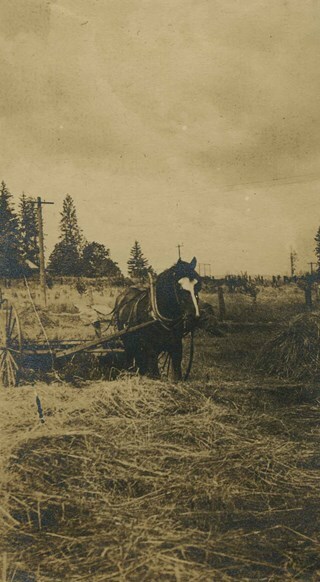 Annotations at the bottom front of the photograph read, "L. Claude Hill's Farm, Burnaby, BC."